Zahf Paroo (b. December 30, 1975 in Burnaby, British Columbia) is a Canadian actor.He was born Zahfeer Abdul Mohammed Hajee and began working in film under the name Zahf Hajee, eventually legally changing his name to his mother's maiden name in 2001. He was raised in the city of Vernon, British Columbia and went to Mount Royal College in Calgary, Alberta where graduated with honors from the Theatre department in 1995.Zahf's film career began with the Disney film Northern Lights starring Diane Keaton, who cast him in the role of her young and arrogant boss. 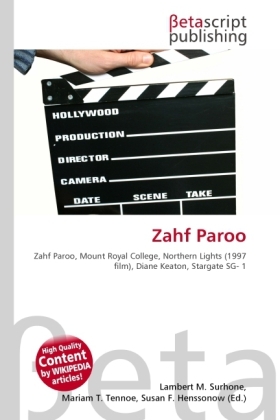 Zahf's first large speaking role in television was a guest star in the first season of the science fiction series Stargate SG-1. His career began to gather momentum after this, and he landed his first large studio picture with the MGM thriller Antitrust starring Ryan Phillippe and Tim Robbins. This project caught casting director's eyes, which led to him being cast in the Farrelly brothers' comedy Say It Isn't So with Chris Klein and Heather Graham.